CHELTENHAM, England (AP) — Racehorse owner John Coleman never got to see one of his best runners, Klassical Dream, compete at the Cheltenham Festival. Eight months after dying from cancer, he was still there on Tuesday as the horse won the opening race of the 2019 meeting. Coleman's ashes were in the handbag of his wife, Jo, who was at Cheltenham for Klassical Dream's victory in the Supreme Novices' Hurdle under jockey Ruby Walsh. "I've bought some of John's ashes with me because he said he wanted to be here, but he knew his time was limited," Jo Coleman said. "I wanted to make sure he got here." It made it a "poignant" victory for Klassical Dream's trainer, Willie Mullins. "John had a lot of cheaper horses with us and then he retired and sold his business and said, 'Here is a few quid, go and buy me a Cheltenham horse.' And this was the horse," Mullins said. "He passed away in the last few months. We're here now so we're going to have a lot of tears and beers celebrating this." Mullins made it a double to start the festival when Duc Des Genievres won the Arkle Novices' Chase, the second race on Tuesday. 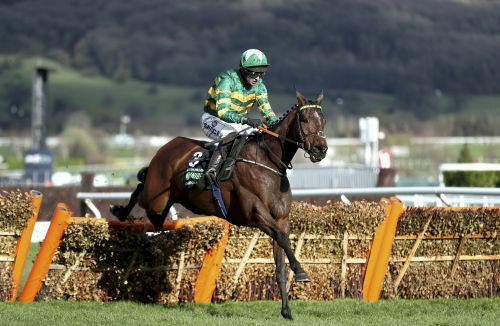 The marquee race of the first day — the Champion Hurdle — was won by 16-1 shot Espoir D'Allen after two-time winner Buveur D'Air fell at the third. Apple's Jade, the 7-4 favorite, stumbled at a early hurdle and finished in sixth place. The second day of the festival is under threat because of strong winds forecast for Wednesday. There will be a morning inspection and if racing is canceled, Wednesday's card will take place on Saturday.